The remark comes after Letterman mocked Trump’s endorsement of GOP candidate Mitt Romney earlier this month. The host joked that Romney’s poor performance in the polls exhibited “the magic of a Donald Trump endorsement,” and that Romney was begging Trump to rescind his endorsement after the candidate lost three states. 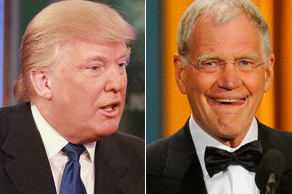 Letterman and Trump also feuded in 2011. Letterman had accused Trump of racism for repeatedly demanding to see President Obama’s birth certificate. Trump retaliated with an angry letter, and canceled an upcoming appearance on the late night show.